Welcome, and thank you for your warm affection! St John Paul II, speaking in Prešov in 1995, borrowed a beautiful image from the surrounding nature to describe the identity and mission of the Greek-Catholic communities: «In the transparent waters the majestic grandeur of the peaks is reflected: this landscape [... ] speaks to us of the beauty and goodness of the Creator. From the southern slopes of the Tatra mountains to the plains of Zemplín, for centuries the communities of the Eastern rite have lived side-by-side with the Latin rite brothers and sisters, who are also called to represent, as small lakes "plesá", the transparent and the luminous generosity of God. It is the Lord himself who enriches his Church with the variety of forms and traditions "(Address to the Catholics of the Byzantine rite, 2 July 1995, 6). The Greek Catholic Church in Slovakia can be considered an expression of the beauty of the variety of the forms of ecclesial life, of that variety which "not only does not harm the unity of the Church, but rather manifests it" (Conc. Ecum. Vat. II, Decree Orientalium Ecclesiarum, 2). Today you are here with the Pope to celebrate the 200th anniversary of the erection of the Prešov Eparchy, born from the dismemberment of your maternal Eparchy of Mukačevo, currently in Ukrainian territory. Your Eparchy developed and became, in turn, the mother of a new ecclesial family, generating other eparchies, one of them in Canada, and became the headquarters of the Metropolia sui iuris ten years ago. Today I can greet all of you today, starting with your Metropolitan Bishop Ján Babjak - who goes to the woods to collect mushrooms and brings them to me - accompanied by the Bishops, Mons. Chautur of Košice, Mons. Rusnák of Bratislava and the new Bishop in Canada Mons. Pacák. Dear brothers, continue your work as guides and fathers of the people of God who have been entrusted to you. Follow the shining example of the blessed martyr Bishops Peter Pavol Gojdič and Vasiľ Hopko. Spread goodness, peace, generosity and meekness, with profound humility and simplicity, always remaining pastors according to the heart of God who is Father, and following in the footsteps of Christ who came not to be served but to serve. In this way I am sure that the priests, your first collaborators, will follow you with ever greater joy and enthusiasm, available to the ecclesial service that is required of them. Dear priests, I greet you all with warm cordiality, celibate and married, with your families, as well as religious. I thank you for your work in the midst of the holy faithful people of God. The families of priests live a particular mission today, when the very ideal of the family is questioned if not explicitly attacked: you offer a testimony of healthy and exemplary life. You too can draw from the examples present in the history of your Church during the decades of persecution in the second half of the last century, in deportations and deprivations of all kinds. I know that Bishop Babjak has collected and published many of their stories. Today it is up to your generation to show the same loyalty, perhaps not in the face of direct and violent persecution, but in the presence of difficulties and dangers of another kind. Today the priests, as well as the seminarians - who equally greet - are tempted by two opposing tendencies: from secularism, which leads them to worldliness, or from an encroachment in obsolete and even non-evangelical ways of understanding their ecclesial role, ways that lead to a sterile clericalism. An exemplary religious life, both male and female, as well as belonging to some of the new ecclesial movements, are part of a strong and healthy ecclesial fabric. Today I repeat the example of Blessed Metod Dominik Trčka, martyr for the faith. In your joyful presence here, together with your Pastors, I see an enthusiastic and devoted face of a Church firm in faith, aware of its dignity and proud of its ecclesial identity. In this way you are worthy sons of evangelization made, in full fidelity to the Apostolic See, by the patron saints of Europe Cyril and Methodius. The continent of Europe, in the East as in the West, needs to rediscover its roots and vocation; and from Christian roots they can only grow solid trees, which bear fruits of full respect for the dignity of man, in every condition and in every phase of life. I encourage you to keep your Byzantine tradition, which I have learned to know and love since I was young: rediscover it and live it fully - as the Second Vatican Ecumenical Council taught -, paying close attention to the paths of evangelization and catechesis in which , even before the shepherds, the protagonists are the parents and the grandparents, from whom many have learned the first prayers and the Christian meaning of life. Thanks to the fathers, mothers, grandparents and all the educators present here for your indispensable testimony! Dear brothers and sisters, I ask you for a special reminder in a moment, when you will celebrate the Divine Liturgy in the Basilica of Santa Maria Maggiore, a temple so precious for the memory of Saints Cyril and Methodius and therefore for your history. 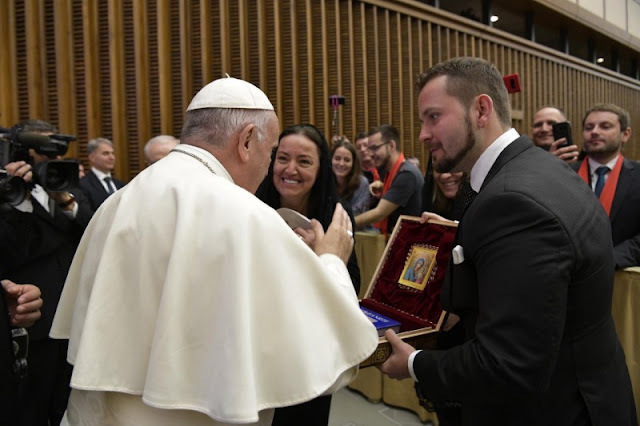 The Holy Mother of God, to whom we look with hope and love of children, defend with her intercession the Church in this time of trial and watch over the work of the Synod of Youth, which we have just begun. I thank you and I bless all of you, your loved ones and the entire Greek Catholic Community in Slovakia.